contributed to the studies by measuring the properties of the galaxies. Astronomers believe that the color and shape of a galaxy is largely controlled by gas flowing through an extended halo around it. The COS observations of distant stars demonstrate that a large mass of clouds is falling through the giant halo of our Milky Way, fueling its ongoing star formation. 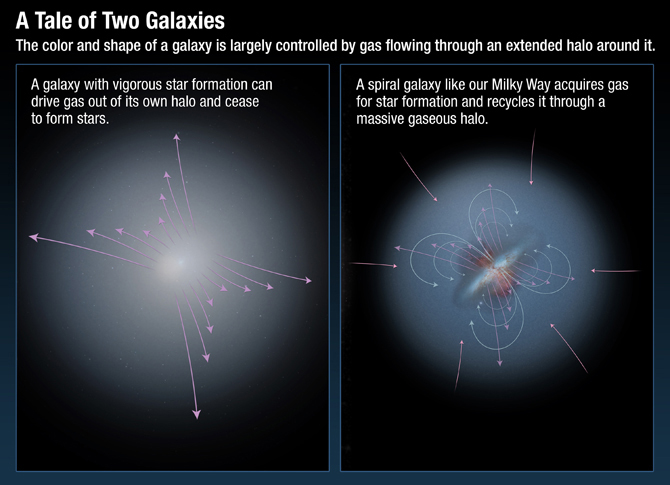 The COS observations also show halos of hot gas surrounding vigorous star-forming galaxies. These halos, rich in heavy elements, extend as much as 450,000 light-years beyond the visible portions of their galactic disks. The amount of heavy-element mass discovered far outside a galaxy came as a surprise. COS measured 10 million solar masses of oxygen in a galaxy’s halo, which corresponds to about one billion solar masses of gas as much as in the entire space between stars in a galaxy’s disk. Researchers also found that this gas is nearly absent from galaxies that have stopped forming stars.